Metropolitan Opera House, New York, May 29 and May 30. WHEN Serge Diaghilev decided to stage The Sleeping Beauty in London the monumental Russian Imperial-era ballet was not an obvious stablemate for the modernist dance works he had introduced with his Ballets Russes. But Diaghilev had his reasons. There was Tchaikovsky’s music, which he admired greatly and which was championed by Stravinsky (who reorchestrated part of the score for Diaghilev), and, more pragmatically, the cash-strapped Diaghilev was inspired by the success of the popular Oscar Asche musical comedy Chu Chin Chow. It ran for five years in London from 1916 and Diaghilev wanted, he said, to put on a show that would run “forever”. As Lynn Garofola writes in Diaghilev’s Ballets Russes, financial statements demonstrate “the precarious thread on which survival of the post-Armistice Ballets Russes hung”. As ever, being daring and experimental was not a guarantee of lasting security. The impresario badly needed money. Titled The Sleeping Princess – apparently Diaghilev didn’t think all his Auroras were beautiful, hence the more prosaic wording – the production didn’t do badly by today’s standards, having a three-month run of more than 100 performances from November 1921 to February 1922. It didn’t, however, recoup its costs. 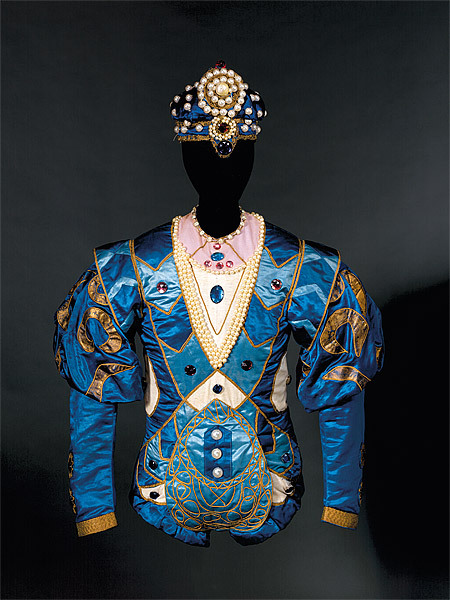 Diaghilev left London quickly to give creditors the slip and Ballets Russes sets, scores, costumes, designs and other items were impounded. That they weren’t widely dispersed and lost is something of a miracle, but at various auctions in the 1960s and 1970s large tranches of the material were bought by cultural institutions, including what would later become the National Gallery of Australia in Canberra. 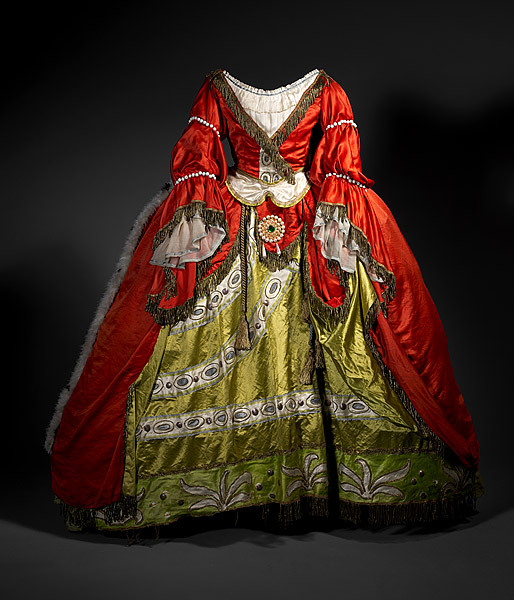 Its rich Ballets Russes holdings, including some Léon Bakst costumes and sketches for The Sleeping Princess (the NGA has the Bluebird’s costume, a wonderful jewel), were shown in a fascinating 2011 exhibition Ballets Russes: The Art of Costume. 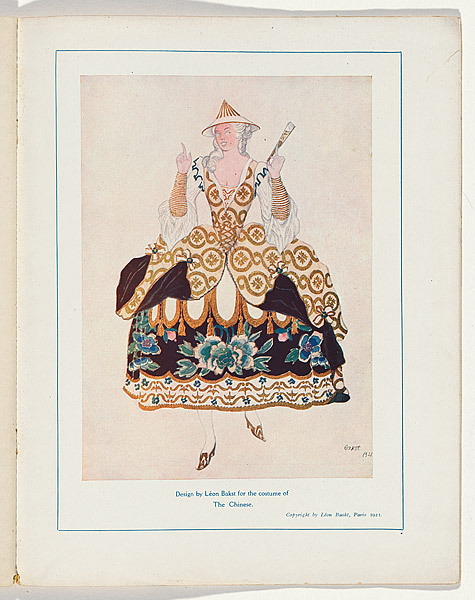 When designer Richard Hudson used Bakst as inspiration for Alexei Ratmansky’s Sleeping Beauty for American Ballet Theatre, there was plenty of excellent research material available. While Hudson’s opulent design references the 1921 production, Ratmansky’s choreography seeks to revive as nearly as possible that of Petipa’s 1890 St Petersburg original, a task made possible by study of the Stepanov notation of the ballet that was taken out of Russia after the 1917 revolution by St Petersburg ballet master Nikolai Sergeyev. Diaghilev also used this resource for his production. The 1921 venture was by no means a dead end. The Sleeping Beauty had failed to get traction in revolutionary Russia but Diaghilev would change its fortunes. The Sleeping Princess may not have achieved its financial goal but it did have a lasting effect on British ballet and beyond. When Sadler’s Wells Ballet (now The Royal Ballet) went to New York in 1949 it opened with The Sleeping Beauty, with Margot Fonteyn in the title role, and made an enormous impact. The company’s director, Ninette de Valois, had appeared in the Diaghilev production, writes Mary Clarke in her 1955 Sadler’s Wells Ballet history, with Clarke commenting that the 1939 Sadler’s Wells production of Beauty, its first, “came far nearer the original” than the Diaghilev version, “many numbers being included which had not been seen since St Petersburg days”. Sadler’s Wells marked important occasions with performances of The Sleeping Beauty and the work would become a touchstone work for The Royal Ballet. It would also become the benchmark classical work for any company. It’s the big one. As with all the Petipa ballets, The Sleeping Beauty has been revised and reinterpreted many times. The Mariinsky staged a reconstruction of the original in 1999 that was not universally admired, not even by the Mariinsky itself it would appear, as the company has retreated from it. (It ran about four hours including intervals and allowed contemporary flourishes such as very high leg extensions for the women.) Now there is Ratmansky’s somewhat slimmer version to give audiences a window into the storied world of Russian Imperial ballet and to shine a light on Petipa’s choreographic style. ABT’s production lasts three hours including two intervals, although rather candidly the ABT program notes that the ballet was cut “somewhat to fit within the union defined time limitation”. Some mime and music had to go. Gillian Murphy as Princess Aurora in The Sleeping Beauty. Photo: Gene Schiavone. Ratmansky’s Beauty is visually extravagant – mostly but not entirely successfully – but nevertheless a deeply impressive spectacle. The scale of the enterprise becomes apparent immediately as members of the court enter to celebrate the christening of Princess Aurora. The King and Queen preside over a large establishment of courtiers, cavaliers, attendants and pages, all gorgeously costumed. The Queen has a huge panniered gown with a lengthy train that requires the constant presence of small boys to carry, arrange and stumble over adorably. The fairies who have come to bestow gifts have their own brilliantly attired cavaliers and cushion-carrying children. The Lilac Fairy, being the highest ranked, has no fewer than eight men to accompany her. There are wigs for all and spectacular hats for many. The wicked fairy Carabosse arrives in a chariot and is supported by rats large and small, the little ones being particularly malevolent while also being on duty to prevent Carabosse from tripping over her extensive train. That is just the Prologue. In the Act I Garland Dance there are no fewer than 48 dancers: 32 adults and 16 students from ABT’s Jacqueline Onassis School. In Act III, Aurora and Prince Désiré enter the ballroom in wonderfully sumptuous white costumes entirely suitable for a royal wedding but not for dancing, so after a few minutes they slip away to change – returning in much simpler garments that from where I was sitting gave the impression that the couple was ready for bed once they’d completed their grand pas de deux. While the display is lavish, it frames a story told with strong, clear mime and many intimate, modest details. In this environment the music sounds immediate and fresh. Many familiar passages make a livelier impact because the more contained physicality means the music is not slowed for multiple fouettés (there are absolutely none here) or high-flying manéges of jetés with double sauts de basque thrown in. Leg extensions are relatively low and there are delightful pirouettes in which the retiré position – where one leg is pulled up and the foot placed against the supporting leg – is not much higher than the ankle. The effect is refined and charming, entirely suitable for a young woman at her birthday party. For both men and women there is a great deal of petit allegro; low, laser-sharp, extremely swift footwork that sparkles. It is as virtuosic, or more so, than today’s emphatic gestures and more intricate and sophisticated. It was pleasing to note alterations in choreography to suit the different gifts and temperaments of the lead dancers. For instance, Sarah Lane and Herman Cornejo, a less grand couple than the first cast of Gillian Murphy and Marcelo Gomes, didn’t do the famous series of fish dives in the Act III pas de deux, and they weren’t missed. In fact, I felt the spirit of romance was better sustained without them, because the fish dives sent the audience’s applause-o-meter off the scale and interrupted the mood – for me, anyway. At both performances I saw those around me were tickled by the Canari qui chante (Canary) fairy variation in the Prologue, its speed and fluttery quality bringing to mind the hummingbird as never before (in the Diaghilev production she is described as the Fairy of the Hummingbird). There were countless felicitious moments, but I particularly relished the double air turn landed on one foot that Cornejo, in the second performance, made look so elegant, and the way he held Lane in a series of supported pirouettes, using just one hand to turn her while his other arm was out-stretched. Darting eyelines and changing head and torso positions added texture and animation to dances, with the Diamond Fairy’s Act III variation particularly notable in this regard. The spell cast by Ratmansky is substantial, although not entirely complete. There are several puzzling dramaturgical decisions. For instance, Carabosse and the Lilac Fairy enter the wedding party together. There has been no repeat of the terrible mistake that saw Carabosse forgotten from the invitation list for the christening with such drastic consequences. All is forgiven and peace reigns. But if you’d blinked twice you would have missed this vital gesture of reconciliation as Carabosse whizzes across the back of the stage and is swallowed up by the throng. Another key moment, the kiss, is similarly underplayed. Aurora’s bed is to the audience’s right and would be difficult to see by those on that side of the theatre. I was seated quite centrally and only just had it fully in my line of vision. You really do want to see that kiss. These are matters easily remedied. Something less easy to find is a sense of deep emotional engagement with the production. It is gracious, grand, meticulous, regal and restrained. It was fascinating to behold and I could easily have watched a third cast, and a fourth, and found more in it. It is a wonderful work of scholarship and I admired it greatly but there was a chill in the air. 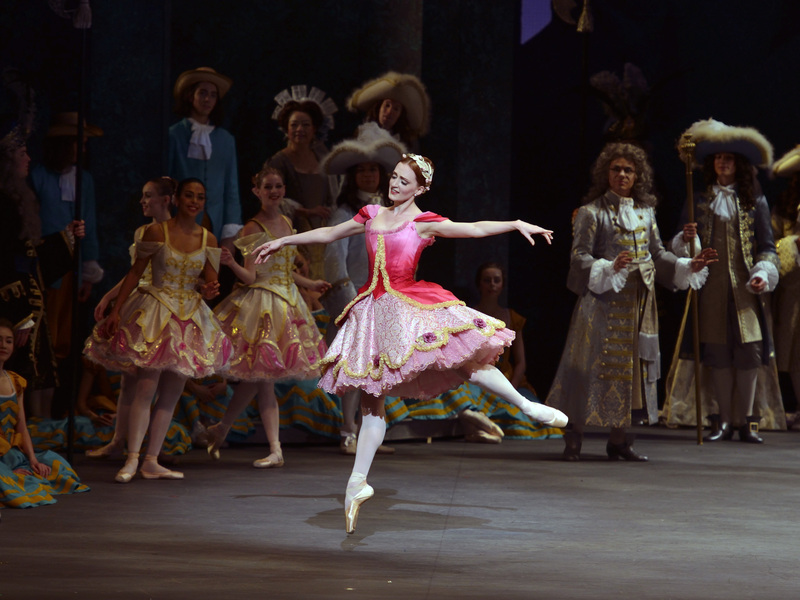 American Ballet Theatre ends its Sleeping Beauty performances on June 13.